As part of Olivet College’s ongoing commitment to the local community, President Steven M. Corey, Ph.D., is pleased to announce that proposals are now being accepted for the 2019-20 Olivet College Community Investment Grant program. In its third year, the College will consider and fund multiple proposals from non-profit and civic organizations with a primary purpose of supporting and enriching the Olivet community and its citizens. 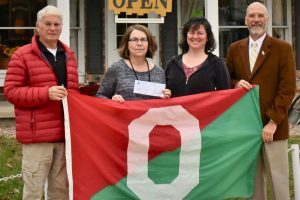 Since 2017, Olivet College has awarded 22 grants totaling nearly $30,000. Proposals for the 2019-20 grant cycle may be submitted online. Applications must be submitted by June 1. Awards will be announced in August 2019. Questions about the grant program or application process may be directed to Barb Spencer, executive assistant to the president, at bspencer@olivetcollege.edu or 269.749.7642.